The Federal Reserve System (also known as the Federal Reserve, and informally as the Fed) is the central banking system of the United States. It was created on December 23, 1913 with the enactment of the Federal Reserve Act largely in response to a series of financial panics, particularly a severe Panic of 1907|panic in 1907. Over time, the roles and responsibilities of the Federal Reserve System have expanded and its structure has evolved. Events such as the Great Depression were major factors leading to changes in the system. The Congress established three key objectives for monetary policy—maximum employment, stable prices, and moderate long-term interest rates—in the Federal Reserve Act. The first two objectives are sometimes referred to as the Federal Reserve's dual mandate. Its duties have expanded over the years, and today, according to official Federal Reserve documentation, include conducting the nation's monetary policy, supervising and regulating banking institutions, maintaining the stability of the financial system and providing financial services to depository institutions, the U.S. government, and foreign official institutions. The Fed also conducts research into the economy and releases numerous publications, such as the Beige Book. 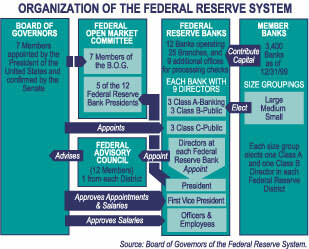 The Federal Reserve System's structure is composed of the presidentially appointed Federal Reserve Board of Governors|Board of Governors (or Federal Reserve Board), the Federal Open Market Committee (FOMC), twelve regional Federal Reserve Banks located in major cities throughout the nation, numerous privately owned U.S. member banks and various advisory councils. The FOMC is the committee responsible for setting monetary policy and consists of all seven members of the Board of Governors and the twelve regional bank presidents, though only five bank presidents vote at any given time. The Federal Reserve System has both private and public components, and was designed to serve the interests of both the general public and private bankers. The result is a structure that is considered unique among central banks. It is also unusual in that an entity outside of the central bank, namely the United States Department of the Treasury, creates the currency used. According to the Board of Governors, the Federal Reserve is independent within government in that "its monetary policy decisions do not have to be approved by the President or anyone else in the executive or legislative branches of government." Its authority is derived from statutes enacted by the U.S. Congress and the System is subject to congressional oversight. The members of the Board of Governors, including its chairman and vice-chairman, are chosen by the President of the United States|President and confirmed by the Senate. The government also exercises some control over the Federal Reserve by appointing and setting the salaries of the system's highest-level employees. Thus the Federal Reserve has both private and public aspects. The U.S. Government receives all of the system's annual profits, after a statutory dividend of 6% on member banks' capital investment is paid, and an account surplus is maintained. In 2010, the Federal Reserve made a profit of $82 billion and transferred $79 billion to the U.S. Treasury. This was followed at the end of 2011 with a transfer of $77 billion in profits to the U.S. Treasury Department. In 1690, the Massachusetts Bay Colony became the first to issue paper money in what would become the United States, but soon others began printing their own money as well. The demand for currency in the colonies was due to the scarcity of coins, which had been the primary means of trade. Colonies' paper currencies were used to pay for their expenses, as well as a means to lend money to the colonies' citizens. Paper money quickly became the primary means of exchange within each colony, and it even began to be used in financial transactions with other colonies. However, some of the currencies were not redeemable in gold or silver, which caused them to depreciate. The Currency Act of 1751 set limits on the issuance of Bills of Credit by the New England states and set requirements for the redemption of any bills issued. This Act was in response to the overissuance of bills by Rhode Island, eventually reducing their value to 1/27 of the issuing value. The Currency Act of 1764 completely banned the issuance of Bills of Credit (paper money) in the colonies and the making of such bills legal tender because their depreciation allowed the discharge of debts with depreciated paper at a rate less than contracted for, to the great discouragement and prejudice of the trade and commerce of his Majesty's subjects. The ban proved extremely harmful to the economy of the colonies and inhibited trade, both within the colonies and abroad. The first attempt at a national currency was during the American Revolutionary War. In 1775 the Continental Congress, as well as the states, began issuing paper currency, calling the bills "Early American currency|Continentals". The Continentals were backed only by future tax revenue, and were used to help finance the Revolutionary War. Overprinting, as well as British counterfeiting caused the value of the Continental to diminish quickly. This experience with paper money led the United States to strip the power to issue Bills of Credit (paper money) from a draft of the new Constitution on August 16, 1787. as well as banning such issuance by the various states, and limiting the states ability to make anything but gold or silver coin legal tender. In 1791 the government granted the First Bank of the United States a charter to operate as the U.S. central bank until 1811. The First Bank of the United States came to an end under James Madison|President Madison because Congress refused to renew its charter. The Second Bank of the United States was established in 1816, and lost its authority to be the central bank of the U.S. twenty years later under Andrew Jackson|President Jackson when its charter expired. Both banks were based upon the Bank of England. Ultimately, a third national bank, known as the Federal Reserve, was established in 1913 and still exists to this day. The first U.S. institution with central banking responsibilities was the First Bank of the United States, chartered by Congress and signed into law by President George Washington on February 25, 1791 at the urging of Alexander Hamilton. This was done despite strong opposition from Thomas Jefferson and James Madison, among numerous others. The charter was for twenty years and expired in 1811 under President Madison, because Congress refused to renew it. In 1816, however, Madison revived it in the form of the Second Bank of the United States. Years later, early renewal of the bank's charter became the primary issue in the reelection of President Andrew Jackson. After Jackson, who was opposed to the central bank, was reelected, he pulled the government's funds out of the bank. Nicholas Biddle (banker)|Nicholas Biddle, President of the Second Bank of the United States, responded by contracting the money supply to pressure Jackson to renew the bank's charter forcing the country into a recession, which the bank blamed on Jackson's policies. Interestingly, Jackson is the only President to completely pay off the national debt. The bank's charter was not renewed in 1836. From 1837 to 1862, in the Free Banking Era there was no formal central bank. From 1862 to 1913, a system of national banks was instituted by the 1863 National Banking Act. A series of bank panics, in 1873, 1893, and 1907, provided strong demand for the creation of a centralized banking system. The main motivation for the third central banking system came from the Panic of 1907, which caused renewed demands for banking and currency reform. During the last quarter of the 19th century and the beginning of the 20th century the United States economy went through a series of financial panics. According to many economists, the previous national banking system had two main weaknesses: an inelastic currency and a lack of liquidity. In 1908, Congress enacted the Aldrich-Vreeland Act, which provided for an emergency currency and established the National Monetary Commission to study banking and currency reform. The National Monetary Commission returned with recommendations which were repeatedly rejected by Congress. A revision crafted during a secret meeting on Jekyll Island by Senator Aldrich and representatives of the nation's top finance and industrial groups later became the basis of the Federal Reserve Act. The House voted on December 22, 1913 with 298 yeas to 60 nays and 76 not voting and the Senate voting on December 23, 1913 with 43 yeas to 25 nays and 27 not voting. President Woodrow Wilson signed the bill later that day at 6:02pm. The head of the bipartisan National Monetary Commission was financial expert and Senate Republican Party (United States)|Republican leader Nelson Aldrich. Aldrich set up two commissions—one to study the American monetary system in depth and the other, headed by Aldrich himself, to study the European central banking systems and report on them. Aldrich went to Europe opposed to centralized banking, but after viewing Germany's monetary system he came away believing that a centralized bank was better than the government-issued bond system that he had previously supported. The primary motivation for creating the Federal Reserve System was to address banking panics. Other purposes are stated in the Federal Reserve Act, such as "to furnish an elastic currency, to afford means of rediscounting commercial paper, to establish a more effective supervision of banking in the United States, and for other purposes". Before the founding of the Federal Reserve, the United States underwent several financial crises. A particularly severe crisis in 1907 led Congress to enact the Federal Reserve Act in 1913. Today the Federal Reserve System has broader responsibilities than only ensuring the stability of the financial system. Bank runs occur because banking institutions in the United States are only required to hold a fraction of their depositors' money in reserve. This practice is called fractional-reserve banking. As a result, most banks invest the majority of their depositors' money. On rare occasion, too many of the bank's customers will withdraw their savings and the bank will need help from another institution to continue operating. Bank runs can lead to a multitude of social and economic problems. The Federal Reserve was designed as an attempt to prevent or minimize the occurrence of bank runs, and possibly act as a lender of last resort if a bank run does occur. Many economists, following Milton Friedman, believe that the Federal Reserve inappropriately refused to lend money to small banks during the bank runs of 1929. The monthly changes in the currency component of the U.S. money supply show currency being added into (% change greater than zero) and removed from circulation (% change less than zero). The most noticeable changes occur around the Christmas holiday shopping season as new currency is created so people can make withdrawals at banks, and then removed from circulation afterwards, when less cash is demanded. Currency that can, by the actions of the central monetary authority, expand or contract in amount warranted by economic conditions. Monetary policy of the Federal Reserve System is based partially on the theory that it is best overall to expand or contract the money supply as economic conditions change. By creating the Federal Reserve System, Congress intended to eliminate the severe financial crises that had periodically swept the nation, especially the sort of financial panic that occurred in 1907. During that episode, payments were disrupted throughout the country because many banks and clearinghouses refused to clear checks drawn on certain other banks, a practice that contributed to the failure of otherwise solvent banks. To address these problems, Congress gave the Federal Reserve System the authority to establish a nationwide check-clearing system. The System, then, was to provide not only an elastic currency—that is, a currency that would expand or shrink in amount as economic conditions warranted—but also an efficient and equitable check-collection system. According to the Federal Reserve Bank of Minneapolis, "the Federal Reserve has the authority and financial resources to act as 'lender of last resort' by extending credit to depository institutions or to other entities in unusual circumstances involving a national or regional emergency, where failure to obtain credit would have a severe adverse impact on the economy." The Federal Reserve System's role as lender of last resort has been criticized because it shifts the risk and responsibility away from lenders and borrowers and places it on others in the form of inflation. Through its discount and credit operations, Reserve Banks provide liquidity to banks to meet short-term needs stemming from seasonal fluctuations in deposits or unexpected withdrawals. Longer term liquidity may also be provided in exceptional circumstances. The rate the Fed charges banks for these loans is the discount rate (officially the primary credit rate). In its role as the central bank of the United States, the Fed serves as a banker's bank and as the government's bank. As the banker's bank, it helps to assure the safety and efficiency of the payments system. As the government's bank, or fiscal agent, the Fed processes a variety of financial transactions involving trillions of dollars. Just as an individual might keep an account at a bank, the U.S. Treasury keeps a checking account with the Federal Reserve, through which incoming federal tax deposits and outgoing government payments are handled. As part of this service relationship, the Fed sells and redeems U.S. government securities such as savings bonds and Treasury bills, notes and bonds. It also issues the nation's coin and paper currency. The U.S. Treasury, through its Bureau of the Mint and Bureau of Engraving and Printing, actually produces the nation's cash supply and, in effect, sells the paper currency to the Federal Reserve Banks at manufacturing cost, and the coins at face value. The Federal Reserve Banks then distribute it to other financial institutions in various ways. During the Fiscal Year 2008, the Bureau of Engraving and Printing delivered 7.7 billion notes at an average cost of 6.4 cents per note. Federal funds are the reserve balances (also called federal reserve accounts) that private banks keep at their local Federal Reserve Bank. These balances are the namesake reserves of the Federal Reserve System. The purpose of keeping funds at a Federal Reserve Bank is to have a mechanism for private banks to lend funds to one another. This market for funds plays an important role in the Federal Reserve System as it is what inspired the name of the system and it is what is used as the basis for monetary policy. Monetary policy works partly by influencing how much interest the private banks charge each other for the lending of these funds. In the current system, private banks are for-profit businesses but government regulation places restrictions on what they can do. The Federal Reserve System is a part of government that regulates the private banks. The balance between privatization and government involvement is also seen in the structure of the system. Private banks elect members of the board of directors at their regional Federal Reserve Bank while the members of the Board of Governors are selected by the President of the United States and confirmed by the Senate. The private banks give input to the government officials about their economic situation and these government officials use this input in Federal Reserve policy decisions. In the end, private banking businesses are able to run a profitable business while the U.S. government, through the Federal Reserve System, oversees and regulates the activities of the private banks. Ben Bernanke (lower-right), Chairman of the Federal Reserve Board of Governors, at a House Financial Services Committee hearing on February 10, 2009. 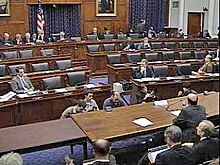 Members of the Board frequently testify before congressional committees such as this one. The Senate equivalent of the House Financial Services Committee is the Senate Committee on Banking, Housing, and Urban Affairs. a part of a discussion or communication among or between members of the Board of Governors and officers and employees of the Federal Reserve System related to items (1), (2), or (3). The financial crisis which began in 2007, corporate bailouts, and concerns over the Fed's secrecy have brought renewed concern regarding ability of the Fed to effectively manage the national monetary system. A July 2009 Gallup Poll found only 30% Americans thought the Fed was doing a good or excellent job, a rating even lower than that for the Internal Revenue Service, which drew praise from 40%. The Federal Reserve Transparency Act was introduced by congressman Ron Paul in order to obtain a more detailed audit of the Fed. The Fed has since hired Linda Robertson who headed the Washington lobbying office of Enron Corp. and was adviser to all three of the Clinton administration's Treasury secretaries. The Board has regular contact with members of the President's Council of Economic Advisers and other key economic officials. The Chairman also meets from time to time with the President of the United States and has regular meetings with the Secretary of the Treasury. The Chairman has formal responsibilities in the international arena as well. Whoever knowingly makes any false statement or report, or willfully overvalues any land, property or security, for the purpose of influencing in any way...shall be fined not more than $1,000,000 or imprisoned not more than 30 years, or both. These aspects of the Federal Reserve System are the parts intended to prevent or minimize speculative asset bubbles, which ultimately lead to severe market corrections. The recent bubbles and corrections in energies, grains, equity and debt products and real estate cast doubt on the efficacy of these controls. The Federal Reserve plays an important role in the U.S. payments system. The twelve Federal Reserve Banks provide banking services to depository institutions and to the federal government. For depository institutions, they maintain accounts and provide various payment services, including collecting checks, electronically transferring funds, and distributing and receiving currency and coin. For the federal government, the Reserve Banks act as fiscal agents, paying Treasury checks; processing electronic payments; and issuing, transferring, and redeeming U.S. government securities. In passing the Depository Institutions Deregulation and Monetary Control Act of 1980, Congress reaffirmed its intention that the Federal Reserve should promote an efficient nationwide payments system. The act subjects all depository institutions, not just member commercial banks, to reserve requirements and grants them equal access to Reserve Bank payment services. It also encourages competition between the Reserve Banks and private-sector providers of payment services by requiring the Reserve Banks to charge fees for certain payments services listed in the act and to recover the costs of providing these services over the long run. The Federal Reserve plays a vital role in both the nation's retail and wholesale payments systems, providing a variety of financial services to depository institutions. Retail payments are generally for relatively small-dollar amounts and often involve a depository institution's retail clients—individuals and smaller businesses. The Reserve Banks' retail services include distributing currency and coin, collecting checks, and electronically transferring funds through the automated clearinghouse system. By contrast, wholesale payments are generally for large-dollar amounts and often involve a depository institution's large corporate customers or counterparties, including other financial institutions. The Reserve Banks' wholesale services include electronically transferring funds through the Fedwire Funds Service and transferring securities issued by the U.S. government, its agencies, and certain other entities through the Fedwire Securities Service. Because of the large amounts of funds that move through the Reserve Banks every day, the System has policies and procedures to limit the risk to the Reserve Banks from a depository institution's failure to make or settle its payments. The Federal Reserve Banks began a multi-year restructuring of their check operations in 2003 as part of a long-term strategy to respond to the declining use of checks by consumers and businesses and the greater use of electronics in check processing. The Reserve Banks will have reduced the number of full-service check processing locations from 45 in 2003 to 4 by early 2011. The Federal Reserve System has a "unique structure that is both public and private", and is described as operating "independently within the government, but independent of it". The System does not require public funding, and derives its authority and purpose from the Federal Reserve Act, which was passed by Congress in 1913 and is subject to Congressional modification or repeal. The four main components of the Federal Reserve System are (1) the Board of Governors, (2) the Federal Open Market Committee, (3) the twelve regional Federal Reserve Banks, and (4) the member banks throughout the country. The Chairman and Vice Chairman of the Board of Governors are appointed by the President from among the sitting Governors. They both serve a four year term and they can be renominated as many times as the President chooses, until their terms on the Board of Governors expire. In late December 2011, President Barack Obama nominated Stein, a Harvard University finance professor and Democrat, and Powell, formerly of Dillon Read, Bankers Trust and The Carlyle Group and a Republican. Both candidates also have Treasury Department experience in the Obama and George H.W. Bush administrations respectively. "Obama administration officials [had] regrouped to identify Fed candidates after Peter Diamond, a Nobel Prize-winning economist, withdrew his nomination to the board in June  in the face of Republican opposition. Richard Clarida, a potential nominee who was a Treasury official under George W. Bush, pulled out of consideration in August ", one account of the December nominations noted. The two other Obama nominees in 2011, Yellen and Raskin, were confirmed in September. One of the vacancies was created in 2011 with the resignation of Kevin Warsh, who took office in 2006 to fill the unexpired term ending January 31, 2018, and resigned his position effective March 31, 2011. In March 2012, U.S. Senator David Vitter (Republican Party of the United States|R, Louisiana|LA) said he would oppose Obama's Stein and Powell nominations, dampening near-term hopes for approval. However Senate leaders reached a deal, paving the way for affirmative votes on the two nominees in May 2012 and bringing the board to full strength for the first time since 2006 with Duke's service after term end. The Federal Open Market Committee (FOMC) consists of 12 members, seven from the Board of Governors and 5 of the regional Federal Reserve Bank presidents. The FOMC oversees open market operations, the principal tool of national monetary policy. These operations affect the amount of Federal Reserve balances available to depository institutions, thereby influencing overall monetary and credit conditions. The FOMC also directs operations undertaken by the Federal Reserve in foreign exchange markets. The president of the Federal Reserve Bank of New York is a permanent member of the FOMC, while the rest of the bank presidents rotate at two- and three-year intervals. All Regional Reserve Bank presidents contribute to the committee's assessment of the economy and of policy options, but only the five presidents who are then members of the FOMC vote on policy decisions. The FOMC determines its own internal organization and, by tradition, elects the Chairman of the Board of Governors as its chairman and the president of the Federal Reserve Bank of New York as its vice chairman. It is informal policy within the FOMC for the Board of Governors and the New York Federal Reserve Bank president to vote with the Chairman of the FOMC; anyone who is not an expert on monetary policy traditionally votes with the chairman as well; and in any vote no more than two FOMC members can dissent. Formal meetings typically are held eight times each year in Washington, D.C. Nonvoting Reserve Bank presidents also participate in Committee deliberations and discussion. The FOMC generally meets eight times a year in telephone consultations and other meetings are held when needed. There are 12 Federal Reserve Banks located in Boston, New York, Philadelphia, Cleveland, Richmond, Atlanta, Chicago, St Louis, Minneapolis, Kansas City, Dallas, and San Francisco. Each reserve Bank is responsible for member banks located in its district. The size of each district was set based upon the population distribution of the United States when the Federal Reserve Act was passed. Each regional Bank has a president, who is the chief executive officer of their Bank. Each regional Reserve Bank's president is nominated by their Bank's board of directors, but the nomination is contingent upon approval by the Board of Governors. Presidents serve five year terms and may be reappointed. Each regional Bank's board consists of nine members. Members are broken down into three classes: A, B, and C. There are three board members in each class. Class A members are chosen by the regional Bank's shareholders, and are intended to represent member banks' interests. Member banks are divided into three categories large, medium, and small. Each category elects one of the three class A board members. Class B board members are also nominated by the region's member banks, but class B board members are supposed to represent the interests of the public. Lastly, class C board members are nominated by the Board of Governors, and are also intended to represent the interests of the public. A member bank is a private institution and owns stock in its regional Federal Reserve Bank. All nationally chartered banks hold stock in one of the Federal Reserve Banks. State chartered banks may choose to be members (and hold stock in their regional Federal Reserve bank), upon meeting certain standards. About 38% of U.S. banks are members of their regional Federal Reserve Bank. The amount of stock a member bank must own is equal to 3% of its combined capital and surplus. However, holding stock in a Federal Reserve bank is not like owning stock in a publicly traded company. These stocks cannot be sold or traded, and member banks do not control the Federal Reserve Bank as a result of owning this stock. The charter and organization of each Federal Reserve Bank is established by law and cannot be altered by the member banks. Member banks, do however, elect six of the nine members of the Federal Reserve Banks' boards of directors. From the profits of the Regional Bank of which it is a member, a member bank receives a dividend equal to 6% of their purchased stock. The remainder of the regional Federal Reserve Banks' profits is given over to the United States Treasury Department. In 2009, the Federal Reserve Banks distributed $1.4 billion in dividends to member banks and returned $47 billion to the U.S. Treasury. The Federal Reserve Banks have an intermediate legal status, with some features of private corporations and some features of public federal agencies. The United States has an interest in the Federal Reserve Banks as tax-exempt federally-created instrumentalities whose profits belong to the federal government, but this interest is not proprietary. In Lewis v. United States, the United States Court of Appeals for the Ninth Circuit stated that: "The Reserve Banks are not federal instrumentalities for purposes of the FTCA [the Federal Tort Claims Act], but are independent, privately owned and locally controlled corporations." The opinion went on to say, however, that: "The Reserve Banks have properly been held to be federal instrumentalities for some purposes." Another relevant decision is Scott v. Federal Reserve Bank of Kansas City, in which the distinction is made between Federal Reserve Banks, which are federally-created instrumentalities, and the Board of Governors, which is a federal agency. According to the web site for the Federal Reserve Bank of Richmond, "[m]ore than one-third of U.S. commercial banks are members of the Federal Reserve System. National banks must be members; state chartered banks may join by meeting certain requirements." The Board of Governors of the Federal Reserve System, the Federal Reserve banks, and the individual member banks undergo regular audits by the GAO and an outside auditor. GAO audits are limited and do not cover "most of the Fed’s monetary policy actions or decisions, including discount window lending (direct loans to financial institutions), open-market operations and any other transactions made under the direction of the Federal Open Market Committee" ...[nor may the GAO audit] "dealings with foreign governments and other central banks." Various statutory changes, including the Federal Reserve Transparency Act, have been proposed to broaden the scope of the audits. November 7, 2008, Bloomberg L.P. News brought a lawsuit (Bloomberg L.P. v. Board of Governors of the Federal Reserve System) against the Board of Governors of the Federal Reserve System to force the Board to reveal the identities of firms for which it has provided guarantees during the Late-2000s financial crisis. Bloomberg, L.P. won at the trial court and the Fed's appeals were rejected at both the United States Court of Appeals for the Second Circuit and the U.S. Supreme Court. The data was released March 31, 2011. The Federal Reserve sets monetary policy by influencing the Federal funds rate, which is the rate of interbank lending of excess reserves. The rate that banks charge each other for these loans is determined in the interbank market but the Federal Reserve influences this rate through the three "tools" of monetary policy described in the Tools section below. This influences the economy through its effect on the quantity of reserves that banks use to make loans. Policy actions that add reserves to the banking system encourage lending at lower interest rates thus stimulating growth in money, credit, and the economy. Policy actions that absorb reserves work in the opposite direction. The Fed's task is to supply enough reserves to support an adequate amount of money and credit, avoiding the excesses that result in inflation and the shortages that stifle economic growth. Open market operations Purchases and sales of U.S. Treasury and federal agency securities—the Federal Reserve's principal tool for implementing monetary policy. The Federal Reserve's objective for open market operations has varied over the years. 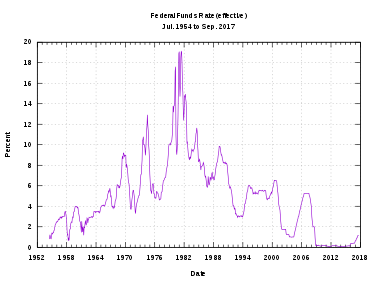 During the 1980s, the focus gradually shifted toward attaining a specified level of the federal funds rate (the rate that banks charge each other for overnight loans of federal funds, which are the reserves held by banks at the Fed), a process that was largely complete by the end of the decade. Discount rate The interest rate charged to commercial banks and other depository institutions on loans they receive from their regional Federal Reserve Bank's lending facility—the discount window. The Federal Reserve System implements monetary policy largely by targeting the federal funds rate. This is the rate that banks charge each other for overnight loans of federal funds, which are the reserves held by banks at the Fed. This rate is actually determined by the market and is not explicitly mandated by the Fed. The Fed therefore tries to align the effective federal funds rate with the targeted rate by adding or subtracting from the money supply through open market operations. The Federal Reserve System usually adjusts the federal funds rate target by 0.25% or 0.50% at a time. Open market operations involve the buying and selling of U.S. government securities (federal agency and mortgage-backed). The term 'open market' means that the Fed doesn't decide on its own which securities dealers it will do business with on a particular day. Rather, the choice emerges from an 'open market' in which the various securities dealers that the Fed does business with—the primary dealers—compete on the basis of price. Open market operations are flexible and thus, the most frequently used tool of monetary policy. The Fed's goal in trading the securities is to affect the federal funds rate, the rate at which banks borrow reserves from each other. When the Fed wants to increase reserves, it buys securities and pays for them by making a deposit to the account maintained at the Fed by the primary dealer's bank. When the Fed wants to reduce reserves, it sells securities and collects from those accounts. Most days, the Fed does not want to increase or decrease reserves permanently so it usually engages in transactions reversed within a day or two. That means that a reserve injection today could be withdrawn tomorrow morning, only to be renewed at some level several hours later. These short-term transactions are called repurchase agreements (repos) – the dealer sells the Fed a security and agrees to buy it back at a later date. Both the discount rate and the federal funds rate influence the prime rate, which is usually about 3 percent higher than the federal funds rate. Another instrument of monetary policy adjustment employed by the Federal Reserve System is the fractional reserve requirement, also known as the required reserve ratio. The required reserve ratio sets the balance that the Federal Reserve System requires a depository institution to hold in the Federal Reserve Banks, which depository institutions trade in the federal funds market discussed above. The required reserve ratio is set by the Board of Governors of the Federal Reserve System. The reserve requirements have changed over time and some of the history of these changes is published by the Federal Reserve. A fourth facility, the Term Deposit Facility, was announced December 9, 2009, and approved April 30, 2010, with an effective date of Jun 4, 2010. The Term Deposit Facility allows Reserve Banks to offer term deposits to institutions that are eligible to receive earnings on their balances at Reserve Banks. Term deposits are intended to facilitate the implementation of monetary policy by providing a tool by which the Federal Reserve can manage the aggregate quantity of reserve balances held by depository institutions. Funds placed in term deposits are removed from the accounts of participating institutions for the life of the term deposit and thus drain reserve balances from the banking system. The Term Securities Lending Facility is a 28-day facility that will offer Treasury general collateral to the Federal Reserve Bank of New York's primary dealers in exchange for other program-eligible collateral. It is intended to promote liquidity in the financing markets for Treasury and other collateral and thus to foster the functioning of financial markets more generally. Like the Term Auction Facility, the TSLF was done in conjunction with the Bank of Canada, the Bank of England, the European Central Bank, and the Swiss National Bank. The resource allows dealers to switch debt that is less liquid for U.S. government securities that are easily tradable. It is anticipated by Federal Reserve officials that the primary dealers, which include Goldman Sachs Group. Inc., J.P. Morgan Chase, and Morgan Stanley, will lend the Treasuries on to other firms in return for cash. That will help the dealers finance their balance sheets. The currency swap lines with the European Central Bank and Swiss National Bank were increased. The Primary Dealer Credit Facility (PDCF) is an overnight loan facility that will provide funding to primary dealers in exchange for a specified range of eligible collateral and is intended to foster the functioning of financial markets more generally. This new facility marks a fundamental change in Federal Reserve policy because now primary dealers can borrow directly from the Fed when this previously was not permitted. The Federal Reserve banks will pay interest on reserve balances (required & excess) held by depository institutions. The rate is set at the lowest federal funds rate during the reserve maintenance period of an institution, less 75bp. As of October 23, 2008, the Fed has lowered the spread to a mere 35 bp. The Federal Reserve initially authorized up to five "small-value offerings are designed to ensure the effectiveness of TDF operations and to provide eligible institutions with an opportunity to gain familiarity with term deposit procedures." After three of the offering auctions were successfully completed, it was announced that small-value auctions would continue on an on-going basis. had a stated maturity that did not exceed 120 days if the Borrower was a bank or 270 days for non-bank Borrowers. The Commercial Paper Funding Facility (CPFF): on October 7, 2008 the Federal Reserve further expanded the collateral it will loan against, to include commercial paper. The action made the Fed a crucial source of credit for non-financial businesses in addition to commercial banks and investment firms. Fed officials said they'll buy as much of the debt as necessary to get the market functioning again. They refused to say how much that might be, but they noted that around $1.3 trillion worth of commercial paper would qualify. There was $1.61 trillion in outstanding commercial paper, seasonally adjusted, on the market as of October 1, 2008, according to the most recent data from the Fed. That was down from $1.70 trillion in the previous week. Since the summer of 2007, the market has shrunk from more than $2.2 trillion. This program lent out a total $738 billion before it was closed. Forty-five out of 81 of the companies participating in this program were foreign firms. Research shows that Troubled Asset Relief Program (TARP) recipients were twice as likely to participate in the program than other commercial paper issuers who did not take advantage of the TARP bailout. The Fed incurred no losses from the CPFF. A little-used tool of the Federal Reserve is the quantitative policy. With that the Federal Reserve actually buys back corporate bonds and mortgage backed securities held by banks or other financial institutions. This in effect puts money back into the financial institutions and allows them to make loans and conduct normal business. The Federal Reserve Board used this policy in the early 1990s when the U.S. economy experienced the savings and loan crisis. The bursting of the United States housing bubble prompted the Fed to buy mortgage-backed securities for the first time in November 2008. Over six weeks, a total of $1.25 trillion were purchased in order stabilize the housing market, about one-fifth of all U.S. government-backed mortgages. The Federal Reserve records and publishes large amounts of data. A few websites where data is published are at the Board of Governors Economic Data and Research page, the Board of Governors statistical releases and historical data page, and at the St. Louis Fed's FRED (Federal Reserve Economic Data) page. The Federal Open Market Committee (FOMC) examines many economic indicators prior to determining monetary policy. The net worth of households and nonprofit organizations in the United States is published by the Federal Reserve in a report titled, Flow of Funds. At the end of fiscal year 2008, this value was $51.5 trillion. The Personal consumption expenditures price index, also referred to as simply the PCE price index, is used as one measure of the value of money. It is a United States-wide indicator of the average increase in prices for all domestic personal consumption. Using a variety of data including U.S. Consumer Price Index and Producer Price Index prices, it is derived from the largest component of the Gross Domestic Product in the BEA's National Income and Product Accounts, personal consumption expenditures. One of the Fed's main roles is to maintain price stability, which means that the Fed's ability to keep a low inflation rate is a long-term measure of the their success. Although the Fed is not required to maintain inflation within a specific range, their long run target for the growth of the PCE price index is between 1.5 and 2 percent. There has been debate among policy makers as to whether or not the Federal Reserve should have a specific inflation targeting policy. There are two types of inflation that are closely tied to each other. Monetary inflation is an increase in the money supply. Price inflation is a sustained increase in the general level of prices, which is equivalent to a decline in the value or purchasing power of money. If the supply of money and credit increases too rapidly over many months (monetary inflation), the result will usually be price inflation. Price inflation does not always increase in direct proportion to monetary inflation; it is also affected by the velocity of money and other factors. With price inflation, a dollar buys less and less over time. The second way that inflation can occur and the more frequent way is by an increase in the velocity of money. This has only been measured since the mid 50's. A healthy economy usually has a velocity of 1.8 to 2.3. If the velocity is too high, then this means that people are not holding on to their money and spending it as fast as they get it. Inflation happens when too many dollars are chasing too few goods. If people are spending as soon as they get it, then there are more "active" dollars in the marketplace, as opposed to sitting in a bank account. This will also cause a price increase. Price inflation makes workers worse off if their incomes don't rise as rapidly as prices. Pensioners living on a fixed income are worse off if their savings do not increase more rapidly than prices. Lenders lose because they will be repaid with dollars that aren't worth as much. Savers lose because the dollar they save today will not buy as much when they are ready to spend it. Debtors win because the dollar they borrow today will be repaid with dollars that aren't worth as much. Businesses and people will find it harder to plan and therefore may decrease investment in future projects. Owners of financial assets suffer. Interest rate-sensitive industries, like mortgage companies, suffer as monetary inflation drives up long-term interest rates and Federal Reserve tightening raises short-term rates. Developed-market currencies become weaker against emerging markets. In his 1995 book The Case Against the Fed, economist Murray N. Rothbard argues that price inflation is caused only by an increase in the money supply, and only banks increase the money supply, then banks, including the Federal Reserve, are the only source of inflation. Adherents of the Austrian School of economic theory blame the economic crisis in the late 2000sTemplate:Failed verification on the Federal Reserve's policy, particularly under the leadership of Alan Greenspan, of credit expansion through historically low interest rates starting in 2001, which they claim enabled the United States housing bubble. One of the stated goals of monetary policy is maximum employment. The unemployment rate statistics are collected by the Bureau of Labor Statistics, and like the PCE price index are used as a barometer of the nation's economic health, and thus as a measure of the success of an administration's economic policies. 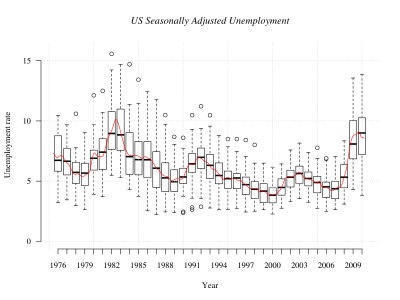 Since 1980, both parties have made progressive changes in the basis for calculating unemployment, so that the numbers now quoted cannot be compared directly to the corresponding rates from earlier administrations, or to the rest of the world. The Federal Reserve is self-funded. The vast majority (90%+) of Fed revenues come from open market operations, specifically the interest on the portfolio of Treasury securities as well as "capital gains/losses" that may arise from the buying/selling of the securities and their derivatives as part of Open Market Operations. The balance of revenues come from sales of financial services (check and electronic payment processing) and discount window loans. The Board of Governors (Federal Reserve Board) creates a budget report once per year for Congress. There are two reports with budget information. The one that lists the complete balance statements with income and expenses as well as the net profit or loss is the large report simply titled, "Annual Report". It also includes data about employment throughout the system. The other report, which explains in more detail the expenses of the different aspects of the whole system, is called "Annual Report: Budget Review". These are comprehensive reports with many details and can be found at the Board of Governors' website under the section "Reports to Congress"
NOTE: The Fed balance sheet shown in this article has assets, liabilities and net equity that do not add up correctly. The Fed balance sheet is missing the item "Reserve Balances with Federal Reserve Banks" which would make the balance sheet balance. The Fed has over $11 billion in gold stock (certificates), which represents the Fed's financial interest in the statutory-determined value of gold turned over to the U.S. Treasury in accordance with the Gold Reserve Act on January 30, 1934. The value reported here is based on a statutory valuation of $42 2/9 per fine troy ounce. As of March 2009, the market value of that gold is around $247.8 billion. The Fed holds more than $1.8 billion in coinage, not as a liability but as an asset. The Treasury Department is actually in charge of creating coins and U.S. Notes. The Fed then buys coinage from the Treasury by increasing the liability assigned to the Treasury's account. The Fed holds at least $534 billion of the national debt. The "securities held outright" value used to directly represent the Fed's share of the national debt, but after the creation of new facilities in the winter of 2007–2008, this number has been reduced and the difference is shown with values from some of the new facilities. The Fed has no assets from overnight repurchase agreements. Repurchase agreements are the primary asset of choice for the Fed in dealing in the open market. Repo assets are bought by creating depository institution liabilities and directed to the bank the primary dealer uses when they sell into the open market. The more than $1 trillion in Federal Reserve Note liabilities represents nearly the total value of all dollar bills in existence; over $176 billion is held by the Fed (not in circulation); and the "net" figure of $863 billion represents the total face value of Federal Reserve Notes in circulation. The $916 billion in deposit liabilities of depository institutions shows that dollar bills are not the only source of government money. Banks can swap deposit liabilities of the Fed for Federal Reserve Notes back and forth as needed to match demand from customers, and the Fed can have the Bureau of Engraving and Printing create the paper bills as needed to match demand from banks for paper money. The amount of money printed has no relation to the growth of the monetary base (M0). The $93.5 billion in Treasury liabilities shows that the Treasury Department does not use private banks but rather uses the Fed directly (the lone exception to this rule is Treasury Tax and Loan because the government worries that pulling too much money out of the private banking system during tax time could be disruptive). The $1.6 billion foreign liability represents the amount of foreign central bank deposits with the Federal Reserve. The $9.7 billion in 'other liabilities and accrued dividends' represents partly the amount of money owed so far in the year to member banks for the 6% dividend on the 3% of their net capital they are required to contribute in exchange for nonvoting stock their regional Reserve Bank in order to become a member. Member banks are also subscribed for an additional 3% of their net capital, which can be called at the Federal Reserve's discretion. All nationally chartered banks must be members of a Federal Reserve Bank, and state-chartered banks have the choice to become members or not. Total capital represents the profit the Fed has earned, which comes mostly from assets they purchase with the deposit and note liabilities they create. Excess capital is then turned over to the Treasury Department and Congress to be included into the Federal Budget as "Miscellaneous Revenue". The Federal Reserve System has faced various criticisms since its inception in 1913. These criticisms include the assertions that the Federal Reserve System violates the United States Constitution and that it impedes economic prosperity. ↑ a b c "Born of a panic: Forming the Federal Reserve System". The Federal Reserve Bank of Minneapolis. August 1988. http://www.minneapolisfed.org/pubs/region/88-08/reg888a.cfm. ↑ a b c BoG 2006, pp. 1 "Just before the founding of the Federal Reserve, the nation was plagued with financial crises. At times, these crises led to 'panics,' in which people raced to their banks to withdraw their deposits. A particularly severe panic in 1907 resulted in bank runs that wreaked havoc on the fragile banking system and ultimately led Congress in 1913 to write the Federal Reserve Act. Initially created to address these banking panics, the Federal Reserve is now charged with a number of broader responsibilities, including fostering a sound banking system and a healthy economy." ↑ BoG 2005, pp. 1 "It was founded by Congress in 1913 to provide the nation with a safer, more flexible, and more stable monetary and financial system. Over the years, its role in banking and the economy has expanded." ↑ Patrick, Sue C. (1993). Reform of the Federal Reserve System in the Early 1930's: The Politics of Money and Banking. Garland. ISBN 978-0-8153-0970-3. ↑ "The Congress established two key objectives for monetary policy-maximum employment and stable prices-in the Federal Reserve Act. These objectives are sometimes referred to as the Federal Reserve's dual mandate". Federalreserve.gov. 2012-01-25. http://www.federalreserve.gov/faqs/money_12848.htm. Retrieved 2012-04-30. ↑ a b "FRB: Mission". Federalreserve.gov. 2009-11-06. http://www.federalreserve.gov/generalinfo/mission/default.htm. Retrieved 2011-10-29. ↑ "Federal Reserve Districs". Federal Reserve Online. http://www.federalreserveonline.org/. Retrieved 2011-08-29. ↑ "Coins and Currency". US Dept of Treasury website. 2011-08-24. http://www.treas.gov/topics/currency/. Retrieved 2011-08-29. ↑ a b "FAQ - Who owns the Federal Reserve?". Federal Reserve website. http://www.federalreserve.gov/faqs/about_14986.htm. ↑ Lapidos, Juliet (2008-09-19). "Is the Fed Private or Public?". Slate. http://www.slate.com/id/2200411/. Retrieved 2011-08-29. ↑ Toma, Mark (February 1, 2010). "Federal Reserve System". EH. Net Encyclopedia. Economic History Association. http://eh.net/encyclopedia/article/toma.reserve. Retrieved February 27, 2011. ↑ "Who owns the Federal Reserve Bank?". FactCheck. March 31, 2008. http://www.factcheck.org/askfactcheck/who_owns_the_federal_reserve_bank.html. Retrieved February 27, 2011. ↑ Appelbaum, Binyamin (March 22, 2011). "Fed Had Profit From Investments of $82 Billion Last Year". The New York Times. http://www.nytimes.com/2011/03/23/business/economy/23fed.html?_r=1&ref=business. Retrieved March 22, 2011. ↑ a b c Flamme, Karen. "1995 Annual Report: A Brief History of Our Nation's Paper Money". Federal Reserve Bank of San Francisco. http://www.frbsf.org/publications/federalreserve/annual/1995/history.html. Retrieved August 26, 2010. ↑ Grubb, Farley (March 30, 2006). "Benjamin Franklin And the Birth of a Paper Money Economy" (PDF). Federal Reserve Bank of Philadelphia. http://www.philadelphiafed.org/publications/economic-education/ben-franklin-and-paper-money-economy.pdf. Retrieved August 26, 2010. ↑ "Eventually, the paper money was received for taxes at the rate of £27 in bills of credit for £1 in silver, and destroyed.". Mises.org. http://mises.org/freemarket_detail.aspx?control=336. Retrieved 2012-04-30. ↑ "The Currency Act of 1764". The Royal Colony of South Carolina. carolana.com. Retrieved January 3, 2012. "This act was not repealed prior to the American Revolution. It had very dire consequences for both North Carolina and South Carolina, both of whose economies were already shaky. The Currency Act was, therefore, a great hardship to trade within and without the colonies and, equally important, proof that the British government put the interests of mother country merchants ahead of theirs. ... The entire text of the Act is provided below." "...and whereas such bills of credit have greatly depreciated in their value, by means whereof debts have been discharged with a much less value than was contracted for, to the great discouragement and prejudice of the trade and commerce of his Majesty's subjects...no act, order, resolution, or vote of assembly, in any of his Majesty's colonies or plantations in America, shall be made, for creating or issuing any paper bills, or bills of credit of any kind or denomination whatsoever, declaring such paper bills, or bills of credit, to be legal tender in payment of any bargains, contracts, debts, dues, or demands whatsoever; and every clause or provision which shall hereafter be inserted in any act, order, resolution, or vote of assembly, contrary to this act, shall be null and void." ↑ ""Mr. Govr. MORRIS moved to strike out "and emit bills on the credit of the U. States"-If the United States had credit such bills would be unnecessary: if they had not, unjust & useless. ... On the motion for striking out N. H. ay. Mas. ay. Ct ay. N. J. no. Pa. ay. Del. ay. Md. no. Va. ay. N. C. ay. S. C. ay. Geo. ay."". Avalon.law.yale.edu. http://avalon.law.yale.edu/18th_century/debates_816.asp. Retrieved 2012-04-30. ↑ US Constitution Article 1, Section 10. "no state shall ..emit Bills of Credit; make any Thing but gold and silver Coin a Tender in Payment of Debts;"
↑ British Parliamentary reports on international finance: the Cunliffe Committee and the Macmillan Committee reports. Ayer Publishing. 1978. ISBN 978-0-405-11212-6. http://books.google.ca/books?hl=en&id=EkUTaZofJYEC&dq=British+Parliamentary+reports+on+international+finance&printsec=frontcover&source=web&ots=kHxssmPNow&sig=UyopnsiJSHwk152davCIyQAMVdw&sa=X&oi=book_result&resnum=1&ct=result#PPA25,M1. "description of the founding of Bank of England: 'Its foundation in 1694 arose out the difficulties of the Government of the day in securing subscriptions to State loans. Its primary purpose was to raise and lend money to the State and in consideration of this service it received under its Charter and various Act of Parliament, certain privileges of issuing bank notes. The corporation commenced, with an assured life of twelve years after which the Government had the right to annul its Charter on giving one year's notice. Subsequent extensions of this period coincided generally with the grant of additional loans to the State'"
↑ a b c Johnson, Roger (December 1999). "Historical Beginnings... The Federal Reserve". Federal Reserve Bank of Boston. p. 8. http://www.bos.frb.org/about/pubs/begin.pdf. Retrieved 2010-07-23. ↑ Herrick, Myron (March 1908). "The Panic of 1907 and Some of Its Lessons". Annals of the American Academy of Political and Social Science. http://links.jstor.org/sici?sici=0002-7162(190803)31%3C8%3ATPO1AS%3E2.0.CO%3B2-7. Retrieved 2011-08-29. ↑ a b Flaherty, Edward (June 16, 1997, updated August 24, 2001). "A Brief History of Central Banking in the United States". Netherlands: University of Groningen. http://odur.let.rug.nl/~usa/E/usbank/bank00.htm. ↑ a b Whithouse, Michael (May 1989). "Paul Warburg's Crusade to Establish a Central Bank in the United States". The Federal Reserve Bank of Minneapolis. http://www.minneapolisfed.org/pubs/region/89-05/reg895d.cfm. Retrieved 2011-08-29. ↑ "For years members of the Jekyll Island Club would recount the story of the secret meeting and by the 1930s the narrative was considered a club tradition.". Jekyllislandhistory.com. http://www.jekyllislandhistory.com/federalreserve.shtml. Retrieved 2012-04-30. ↑ "Papers of Frank A.Vanderlip "I wish I could sit down with you and half a dozen others in the sort of conference that created the Federal Reserve Act"" (PDF). http://fraser.stlouisfed.org/chfrs/record.php?id=5653. Retrieved 2012-04-30. ↑ "The Federal Reserve Act of 1913 - A Legislative History". Llsdc.org. http://www.llsdc.org/FRA-LH/. Retrieved 2012-04-30. ↑ "Affixes His Signature at 6:02 P.M., Using Four Gold Pens.". New York Times. 1913-12-24. http://query.nytimes.com/mem/archive-free/pdf?res=9B04E3DB173DE633A25757C2A9649D946296D6CF. Retrieved 2012-04-30. ↑ a b c "Paul Warburg's Crusade to Establish a Central Bank in the United States". The Federal Reserve Bank of Minneapolis. http://www.minneapolisfed.org/publications_papers/pub_display.cfm?id=3815. ↑ a b c d "America's Unknown Enemy: Beyond Conspiracy". American Institute of Economic Research. http://www.cooperativeindividualism.org/aier_on_conspiracy_04.html. ↑ "Congressional Record - House". Scribd.com. 1913-12-22. p. 1465. http://www.scribd.com/doc/17411624/Congressional-Record-Dec-22-1913-pg1465. Retrieved 2011-08-29. ↑ "Congressional Record - Senate". Scribd.com. 1913-12-23. p. 1468. http://www.scribd.com/doc/17234309/Congressional-Record-Dec-23-1913. Retrieved 2011-08-29. ↑ "Federal Reserve Act". Board of Governors of the Federal Reserve System. May 14, 2003. Archived from the original on May 17, 2008. http://web.archive.org/web/20080517044141/http://www.federalreserve.gov/GeneralInfo/fract/. ↑ Remarks by Governor Ben S. Bernanke Before the National Economists Club, Washington, D.C. (2002-11-21). "Deflation: Making Sure "It" Doesn't Happen Here". Board of Governors of the Federal Reserve System. http://www.federalreserve.gov/BOARDDOCS/SPEECHES/2002/20021121/default.htm. Retrieved 2011-10-29. ↑ Bernanke, Ben (2003-10-24). "Remarks by Governor Ben S. Bernanke: At the Federal Reserve Bank of Dallas Conference on the Legacy of Milton and Rose Friedman's Free to Choose, Dallas, Texas" (text). http://www.federalreserve.gov/boardDocs/Speeches/2003/20031024/default.htm. ↑ a b c "The Federal Reserve, Monetary Policy and the Economy—Everyday Economics—FRB Dallas". Dallasfed.org. http://www.dallasfed.org/educate/everyday/ev4.html. Retrieved 2011-08-29. ↑ "Press Release: Federal Reserve Board, with full support of the Treasury Department, authorizes the Federal Reserve Bank of New York to lend up to $85 billion to the American International Group (AIG)". Board of Governors of the Federal Reserve. 2008-09-16. http://www.federalreserve.gov/newsevents/press/other/20080916a.htm. Retrieved 2011-08-29. ↑ Andrews, Edmund L.; de la Merced, Michael J.; Walsh, Mary Williams (2008-09-16). "Fed's $85 Billion Loan Rescues Insurer". The New York Times. http://www.nytimes.com/2008/09/17/business/17insure.html?hp. Retrieved 2008-09-17. ↑ "How Currency Gets into Circulation". Federal Reserve Bank of New York. June 2008. http://www.newyorkfed.org/aboutthefed/fedpoint/fed01.html. Retrieved 2011-08-29. ↑ "Annual Production Figures". Bureau of Engraving and Printing. http://www.bep.treas.gov/uscurrency/annualproductionfigures.html. Retrieved 2011-08-29. ↑ "Federal Funds". Federal Reserve Bank of New York. August 2007. http://www.newyorkfed.org/aboutthefed/fedpoint/fed15.html. Retrieved 2011-08-29. ↑ Cook, Timothy Q.; Laroche, Robert K., eds (1993). "Instruments of the Money Market". Federal Reserve Bank of Richmond. http://www.richmondfed.org/publications/research/special_reports/instruments_of_the_money_market/pdf/full_publication.pdf. Retrieved 2011-08-29. ↑ "FRB: Speech-Kohn, The Evolving Role of the Federal Reserve Banks". Federalreserve.gov. 2006-11-03. http://www.federalreserve.gov/newsevents/speech/kohn20061103a.htm. Retrieved 2011-08-29. ↑ "Federal Reserve System Current and Future Challenges Require System wide Attention: Statement of Charles A. Bowsher". United States General Accounting Office. 1996-07-26. http://www.gao.gov/archive/1996/gg96159t.pdf. Retrieved 2011-08-29. Under the Federal Banking Agency Audit Act, 31 U.S.C. section 714(b), our audits of the Federal Reserve Board and Federal Reserve banks may not include (1) transactions for or with a foreign central bank or government, or nonprivate international financing organization; (2) deliberations, decisions, or actions on monetary policy matters; (3) transactions made under the direction of the Federal Open Market Committee; or (4) a part of a discussion or communication among or between members of the Board of Governors and officers and employees of the Federal Reserve System related to items (1), (2), or (3). See Federal Reserve System Audits: Restrictions on GAO's Access (GAO/T-GGD-94-44), statement of Charles A. Bowsher. The real purpose of this historic "duck hunt" was to formulate a plan for U.S. banking and currency reform that Aldrich could present to Congress. ↑ "About The Audit". Audit the Fed Coalition. 2009. http://www.auditthefed.com/about-the-audit/. Retrieved 2011-08-29. Although the Fed is currently audited by outside agencies, these audits are not thorough and do not include monetary policy decisions or agreements with foreign central banks and governments. The crucial issue of Federal Reserve transparency requires an analysis of 31 USC 714, the section of U.S. Code which establishes that the Federal Reserve may be audited by the Government Accountability Office (GAO), but which simultaneously severely restricts what the GAO may in fact audit. Essentially, the GAO is only allowed to audit check-processing, currency storage and shipments, and some regulatory and bank examination functions, etc. The most important matters, which directly affect the strength of the dollar and the health of the financial system, are immune from oversight. ↑ "An Open Letter to the U.S. House of Representatives". Audit the Fed Coalition. 2009. http://www.auditthefed.com/. Retrieved 2011-08-29. ↑ Reddy, Sudeep (2009-11-23). "Congress Grows Fed Up Despite Central Bank's Push". The Wall Street Journal. http://online.wsj.com/article/SB125876136781358287.html. Retrieved 2011-08-29. The Fed's ability to influence Congress is diluted by public anger. A July 2009 Gallup Poll found only 30% Americans thought the Fed was doing a good or excellent job, a rating even lower than that for the Internal Revenue Service, which drew praise from 40%. ↑ Schmidt, Robert (2009-06-05). "Fed Intends to Hire Lobbyist in Campaign to Buttress Its Image". Bloomberg. http://www.bloomberg.com/apps/news?pid=20601087&sid=aZjQKyLci1AM. Retrieved 2011-08-29. ↑ "Board Actions taken during the week ending July 25, 2009". http://www.federalreserve.gov/releases/h2/20090725/default.htm. Retrieved 2011-08-29. ↑ "VP Linda Robertson to join Federal Reserve System". The Johns Hopkins University. http://gazette.jhu.edu/2009/06/08/vp-linda-robertson-to-join-federal-reserve-system/. Retrieved 2011-08-29. ↑ Mark Calabria, Bert Ely, Congressman Ron Paul, Gilbert Schwartz. (2009-06-24). Ron Paul: Bringing Transparency to the Federal Reserve. Cato Institute: FORA.tv.. Event occurs at 00:11:04. http://fora.tv/2009/06/24/Ron_Paul_Bringing_Transparency_to_the_Federal_Reserve. Retrieved 2011-08-29. ↑ See example: "Advantages of Being/Becoming a State Chartered Bank". Arkansas State Bank Department. 2009-03-31. http://www.state.ar.us/bank/benefits_advantages.html. Retrieved 2011-08-29. ↑ "U.S. Code Title 12, Chapter 3, Subchapter 7, Section 301. Powers and duties of board of directors; suspension of member bank for undue use of bank credit". Law.cornell.edu. 2010-06-22. http://www.law.cornell.edu/uscode/html/uscode12/usc_sec_12_00000301----000-.html. Retrieved 2011-08-29. ↑ "U.S. Code: Title 18, Part 1, Chapter 47, section 1014. Loan and credit applications generally; renewals and discounts; crop insurance". Law.cornell.edu. 2010-06-28. http://www.law.cornell.edu/uscode/18/1014.html. Retrieved 2011-08-29. ↑ "Federal Reserve Board: Payments Systems". Federalreserve.gov. 2011-07-21. http://www.federalreserve.gov/paymentsystems/default.htm. Retrieved 2011-08-29. ↑ a b "Is The Fed Public Or Private?" Federal Reserve Bank of Philadelphia. Retrieved June 29, 2012. ↑ a b "FRB: Board Members". Federalreserve.gov. 2011-07-20. http://www.federalreserve.gov/aboutthefed/bios/board/default.htm. Retrieved 2011-08-29. ↑ "Membership of the Board of Governors of the Federal Reserve System, 1914–Present". Federalreserve.gov. 2011-08-12. http://www.federalreserve.gov/bios/boardmembership.htm. Retrieved 2011-08-29. ↑ a b Goldstein, Steve (December 27, 2011). "Obama to nominate Stein, Powell to Fed board". MarketWatch. Retrieved December 27, 2011. ↑ "Jerome Powell: Visiting Scholar". Bipartisan Policy Center. Retrieved December 27, 2011. ↑ Lanman, Scott; Runningen, Roger (December 27, 2011). "Obama to Choose Powell, Stein for Fed Board". Bloomberg LP. Retrieved December 27, 2011. ↑ Robb, Greg (April 29, 2010). "Obama nominates 3 to Federal Reserve board". MarketWatch. Retrieved April 29, 2010. ↑ Lanman, Scott (September 30, 2010). "Yellen, Raskin Win Senate Approval for Fed Board of Governors". Bloomberg LP. Retrieved December 27, 2011. ↑ Censky, Annalyn (February 10, 2011). "Fed inflation hawk Warsh resigns". CNNMoney. Retrieved December 27, 2011. ↑ Chan, Sewell (February 10, 2011). "Sole Fed Governor With Close Ties to Conservatives Resigns". The New York Times. Retrieved December 27, 2011. ↑ Robb, Greg (March 28, 2012). "Senator to block quick vote on Fed picks: report". MarketWatch. Retrieved March 28, 2012. ↑ Robb, Greg, "Stein sworn in as Fed governor", MarketWatch, May 30, 2012. Retrieved 2012-05-30. ↑ "FRB: Federal Reserve Bank Presidents". Federalreserve.gov. 2011-07-20. http://www.federalreserve.gov/aboutthefed/bios/banks/default.htm. Retrieved 2011-08-29. ↑ "US CODE: Title 12, Subchapter VII—Directors of Federal Reserve Banks; Reserve Agents and Assistants". Law.cornell.edu. 2010-06-22. http://www.law.cornell.edu/uscode/html/uscode12/usc_sup_01_12_10_3_20_VII.html. Retrieved 2011-08-29. ↑ "Who owns the Federal Reserve Bank?". http://www.factcheck.org/askfactcheck/who_owns_the_federal_reserve_bank.html. Retrieved October, 16 2010. ↑ "Section 2.3 Subscription to Stock by National Banks". Federal Reserve Act. Board of Governors of the Federal Reserve System. December 14, 2010. http://www.federalreserve.gov/aboutthefed/section2.htm. Retrieved February 6, 2011. ↑ "Section 5.1 Amount of Shares; Increase and Decrease of Capital; Surrender and Cancellation of Stock". Federal Reserve Act. Board of Governors of the Federal Reserve System. December 14, 2010. http://www.federalreserve.gov/aboutthefed/section5.htm. Retrieved February 6, 2011. ↑ Woodward, G. Thomas (1996-07-31). "Money and the Federal Reserve System: Myth and Reality – CRS Report for Congress, No. 96-672 E". Congressional Research Service Library of Congress. http://home.hiwaay.net/~becraft/FRS-myth.htm. Retrieved 2008-11-23. ↑ "The Federal Reserve Board 2009 Annual Report – Federal Reserve Banks Combined Financial Statements". Federalreserve.gov. 2011-07-22. http://www.federalreserve.gov/boarddocs/rptcongress/annual09/sec6/c3.htm. Retrieved 2011-08-29. ↑ a b Kennedy C. Scott v. Federal Reserve Bank of Kansas City, et al., 406 F.3d 532 (8th Cir. 2005). ↑ 680 F.2d 1239 (9th Cir. 1982). ↑ Michael D. Reagan, "The Political Structure of the Federal Reserve System," American Political Science Review, Vol. 55 (March 1961), pp. 64-76, as reprinted in Money and Banking: Theory, Analysis, and Policy, p. 153, ed. by S. Mittra (Random House, New York 1970). ↑ "Federal Reserve Membership". Federal Reserve Bank of Richmond. http://www.richmondfed.org/banking/federal_reserve_membership/. Retrieved 2012-04-30. ↑ Reddy, Sudeep (2009-08-31 August 31, 2009). "What would a federal reserve audit show". The Wall Street Journal. http://blogs.wsj.com/economics/2009/08/31/what-would-a-federal-reserve-audit-show/tab/article/. Retrieved 2011-08-29. ↑ Docket entry 31, Bloomberg, L.P. v. Board of Governors of the Federal Reserve System, case no. 1:08-cv-09595-LAP, U.S. District Court for the District of New York. ↑ Keoun,Kuntz,Benedetti-Valentini,Buhayar,Campbell,Condon,Finch,Frye,Griffin,Harper,Hyuga,Ivry,Kirchfeld,Kopecki,Layne,Logutenkova,Martens,Moore,Mustoe,Son,Sterngold. "The Fed’s Secret Liquidity Lifelines". Bloomberg. http://www.bloomberg.com/data-visualization/federal-reserve-emergency-lending/#/overview/?sort=nomPeakValue&group=none&view=peak&position=0&comparelist=&search=. Retrieved 17 March 2012. ↑ Torres, Craig (March 31, 2011). "Fed Releases Discount-Window Loan Records Under Court Order". Businessweek. http://www.businessweek.com/news/2011-03-31/fed-releases-discount-window-loan-records-under-court-order.html. Retrieved 19 March 2012. ↑ a b "FRB: Federal Open Market Committee". Federalreserve.gov. 2011-08-22. http://www.federalreserve.gov/monetarypolicy/fomc.htm. Retrieved 2011-08-29. ↑ "FRB: Monetary Policy, Open Market Operations". Federalreserve.gov. 2010-01-26. http://www.federalreserve.gov/fomc/fundsrate.htm. Retrieved 2011-08-29. ↑ "FRB: Monetary Policy, the Discount Rate". Federalreserve.gov. 2011-07-19. http://www.federalreserve.gov/monetarypolicy/discountrate.htm. Retrieved 2011-08-29. ↑ a b "FRB: Monetary Policy, Reserve Requirements". Federalreserve.gov. 2010-10-26. http://www.federalreserve.gov/monetarypolicy/reservereq.htm. Retrieved 2011-08-29. ↑ "Open Market Operations". New York Federal Reserve Bank. August 2007. http://www.newyorkfed.org/aboutthefed/fedpoint/fed32.html. Retrieved 2011-10-29. ↑ "Repurchase and Reverse Repurchase Transactions—Fedpoints—Federal Reserve Bank of New York". Ny.frb.org. August 2007. http://www.ny.frb.org/aboutthefed/fedpoint/fed04.html. Retrieved 2011-08-29. ↑ Patricia S. Pollard (February 2003). "A Look Inside Two Central Banks: The European Central Bank And The Federal Reserve". Review (Federal Reserve Bank of St. Louis) 85 (2): 11–30. doi:10.3886/ICPSR01278. OCLC 1569030. ↑ Feinman, Joshua N. (June 1993). "Reserve Requirements: History, Current Practice, and Potential Reform" (PDF). Federal Reserve Bulletin: 569–589. http://www.federalreserve.gov/monetarypolicy/0693lead.pdf. Retrieved 2011-08-29. ↑ "FRB: Press Release-Board announces that it will begin to pay interest on depository institutions required and excess reserve balances-October 6, 2008". Federal Reserve. 2008-10-06. http://www.federalreserve.gov/monetarypolicy/20081006a.htm. Retrieved 2011-08-29. ↑ a b c "FRB: Temporary Auction Facility FAQ". Federalreserve.gov. 2009-01-12. http://www.federalreserve.gov/monetarypolicy/taffaq.htm. Retrieved 2011-08-29. ↑ "FRB: Press Release-Federal Reserve intends to continue term TAF auctions as necessary". Federalreserve.gov. 2007-12-21. http://www.federalreserve.gov/newsevents/press/monetary/20071221b.htm. Retrieved 2011-08-29. ↑ "FRB press release: Announcement of the creation of the Term Securities Lending Facility". Federal Reserve. 2008-03-11. http://federalreserve.gov/newsevents/press/monetary/20080311a.htm. Retrieved 2011-08-29. ↑ "Fed Seeks to Limit Slump by Taking Mortgage Debt". bloomberg.com. 12 March 2008. http://www.bloomberg.com/apps/news?pid=20601103&sid=a6aFI7RKVhEA&refer=news. "The step goes beyond past initiatives because the Fed can now inject liquidity without flooding the banking system with cash...Unlike the newest tool, the past steps added cash to the banking system, which affects the Fed's benchmark interest rate...By contrast, the TSLF injects liquidity by lending Treasuries, which doesn't affect the federal funds rate. That leaves the Fed free to address the mortgage crisis directly without concern about adding more cash to the system than it wants"
↑ "Federal Reserve Announces Establishment of Primary Dealer Credit Facility—Federal Reserve Bank of New York". Newyorkfed.org. 2008-03-16. http://www.newyorkfed.org/newsevents/news/markets/2008/rp080316.html. Retrieved 2011-08-29. ↑ Lanman, Scott (2008-03-20). "Fed Says Securities Firms Borrow $28.8 Bln With New Financing". Bloomberg.com. http://www.bloomberg.com/apps/news?pid=20601068&sid=a7VHAq.o6kwU. Retrieved 2011-08-29. ↑ a b "Primary Dealer Credit Facility: Frequently Asked Questions—Federal Reserve Bank of New York". Newyorkfed.org. 2009-02-03. http://www.newyorkfed.org/markets/pdcf_faq.html. Retrieved 2011-08-29. ↑ "Fed Announces Emergency Steps to Ease Credit Crisis – Economy". Reuters. Cnbc.com. 2008-03-17. http://www.cnbc.com/id/23664032/. Retrieved 2011-08-29. ↑ "Federal Reserve Bank of Atlanta—Examining the Federal Reserve's New Liquidity Measures". Frbatlanta.org. 2008-04-15. http://www.frbatlanta.org/invoke.cfm?objectid=526AFBC6-5056-9F12-120FEABD6D2ADA91&method=display_body. Retrieved 2011-08-29. ↑ "Reserve Requirements of Depository Institutions Policy on Payment System Risk," 75 Federal Register 86 (5 May 2010), pp. 24384 – 24389. ↑ "Announcement of the creation of the Term Auction Facility—FRB: Press Release—Federal Reserve and other central banks announce measures designed to address elevated pressures in short-term funding markets". federalreserve.gov. 12 December 2007. http://www.federalreserve.gov/newsevents/press/monetary/20071212a.htm. ↑ "US banks borrow $50bn via new Fed facility". Financial Times. 18 February 2008. http://www.ft.com/cms/s/66db756a-de5d-11dc-9de3-0000779fd2ac.html. "Before its introduction, banks either had to raise money in the open market or use the so-called "discount window" for emergencies. However, last year many banks refused to use the discount window, even though they found it hard to raise funds in the market, because it was associated with the stigma of bank failure"
↑ "Fed Boosts Next Two Special Auctions to $30 Billion". Bloomberg. January 4, 2008. http://www.bloomberg.com/apps/news?pid=20601103&refer=news&sid=aBPbErlft9cI. "The Board of Governors of the Federal Reserve System established the temporary Term Auction Facility, dubbed TAF, in December to provide cash after interest-rate cuts failed to break banks' reluctance to lend amid concern about losses related to subprime mortgage securities. The program will make funding from the Fed available beyond the 20 authorized primary dealers that trade with the central bank"
↑ "A dirty job, but someone has to do it". economist.com. 2007-12-13. http://www.economist.com/displaystory.cfm?story_id=10286586. Retrieved 2011-08-29. "The Fed's discount window, for instance, through which it lends direct to banks, has barely been approached, despite the soaring spreads in the interbank market. The quarter-point cuts in its federal funds rate and discount rate on December 11 were followed by a steep sell-off in the stockmarket...The hope is that by extending the maturity of central-bank money, broadening the range of collateral against which banks can borrow and shifting from direct lending to an auction, the central bankers will bring down spreads in the one- and three-month money markets. There will be no net addition of liquidity. What the central bankers add at longer-term maturities, they will take out in the overnight market. But there are risks. The first is that, for all the fanfare, the central banks' plan will make little difference. After all, it does nothing to remove the fundamental reason why investors are worried about lending to banks. This is the uncertainty about potential losses from subprime mortgages and the products based on them, and—given that uncertainty—the banks' own desire to hoard capital against the chance that they will have to strengthen their balance sheets." ↑ "Unclogging the system". economist.com. 2007-12-13. http://www.economist.com/daily/news/displaystory.cfm?story_id=10278482&top_story=1. Retrieved 2011-08-29. ↑ a b Robb, Greg (2007-12-12). "Fed, top central banks to flood markets with cash". Marketwatch.com. http://www.marketwatch.com/news/story/fed-top-central-banks-flood/story.aspx?guid=%7b6FAFC482-F8E4-4F23-A021-52DC7DE8938C%7d&print=true&dist=printTop. Retrieved 2011-08-29. ↑ "Interest on Required Reserve Balances and Excess Balances". Federal Reserve Board. 2008-10-06. http://www.federalreserve.gov/monetarypolicy/reqresbalances.htm. Retrieved 2008-10-14. ↑ "Press Release – October 22, 2008". Federal Reserve Board. 2008-10-22. http://www.federalreserve.gov/newsevents/press/monetary/20081022a.htm. Retrieved 2008-10-22. ↑ "Federal Reserve Board approves amendments to Regulation D authorizing Reserve Banks to offer term deposits". Federalreserve.gov. 2010-04-30. http://www.federalreserve.gov/newsevents/press/monetary/20100430a.htm. Retrieved 2011-08-29. ↑ "Board authorizes small-value offerings of term deposits under the Term Deposit Facility". Federalreserve.gov. 2010-05-10. http://www.federalreserve.gov/newsevents/press/monetary/20100510b.htm. Retrieved 2011-08-29. ↑ "Board authorizes ongoing small-value offerings of term deposits under the Term Deposit Facility". Federalreserve.gov. 2010-09-08. http://www.federalreserve.gov/newsevents/press/monetary/20100908a.htm. Retrieved 2011-08-29. ↑ Zumbrun, Joshua (September 8, 2010). "Fed to Sell Term Deposits to Ensure Exit 'Readiness'". Bloomberg. http://www.bloomberg.com/news/2010-09-08/fed-to-sell-5-billion-of-term-deposits-to-ensure-readiness-.html. Retrieved September 10, 2010. ↑ Wilson, Linus; Wu, Yan (August 22, 2011). Does Receiving TARP Funds Make it Easier to Roll Your Commercial Paper Onto the Fed?. Social Science Electronic Publishing. ↑ Heard on All Things Considered (2010-08-26). "Federal Reserve Mortgage Purchase Program : Planet Money". NPR. http://www.npr.org/templates/transcript/transcript.php?storyId=129451895. Retrieved 2011-08-29. ↑ "FRB: Economic Research & Data". Federalreserve.gov. 2011-08-24. http://federalreserve.gov/econresdata/default.htm. Retrieved 2011-08-29. ↑ "Federal Reserve Board – Statistics: Releases and Historical Data". Federalreserve.gov. 2010-05-10. http://www.federalreserve.gov/releases/. Retrieved 2011-08-29. ↑ "St. Louis Fed: Economic Data – FRED". Research.stlouisfed.org. 2011-08-20. http://research.stlouisfed.org/fred2/. Retrieved 2011-08-29. ↑ White, Lawrence H. (August 2005). "The Federal Reserve System's Influence on Research in Monetary Economics". Econ Journal Watch 2 (2): 325–354. http://econjwatch.org/articles/the-federal-reserve-system-s-influence-on-research-in-monetary-economics. Retrieved 2011-08-29. ↑ FRB: Z.1 Release—Flow of Funds Accounts of the United States, Release Dates See the pdf documents from 1945 to 2007. The value for each year is on page 94 of each document (the 99th page in a pdf viewer) and duplicated on page 104 (109th page in pdf viewer). It gives the total assets, total liabilities, and net worth. This chart is of the net worth. ↑ "Discontinuance of M3". Federalreserve.gov. 2005-11-10. http://www.federalreserve.gov/Releases/h6/discm3.htm. Retrieved 2011-08-29. ↑ "Is the Fed’s Definition of Price Stability Evolving?". Federal Reserve Bank of St. Louis. November 9, 2010. http://research.stlouisfed.org/publications/es/10/ES1033.pdf. Retrieved February 13, 2011. ↑ "Remarks by Governor Ben S. Bernanke - A perspective on inflation targeting". Federalreserve.gov. 2003-03-25. http://www.federalreserve.gov/Boarddocs/Speeches/2003/20030325/default.htm. Retrieved 2011-08-29. ↑ "What's The Fuss Over Inflation Targeting?". Businessweek.com. 2005-11-07. http://www.businessweek.com/magazine/content/05_45/b3958607.htm. Retrieved 2011-08-29. ↑ Bernanke, Ben S. (2005). The Inflation-Targeting Debate. University of Chicago Press. ISBN 978-0-226-04471-2. http://www.press.uchicago.edu/cgi-bin/hfs.cgi/00/16485.ctl. Retrieved 2011-08-29. ↑ Lanman, S. and Kennedy, S. (2011-09-19). "Bernanke Joins King Tolerating Inflation". Bloomberg. http://www.bloomberg.com/news/2011-09-18/bernanke-joins-king-tolerating-more-inflation-as-economies-fail-to-revive.html. Retrieved 2011-09-21. ↑ O'Driscoll, Gerald P. Jr. (April 20, 2010). "An Economy of Liars". The Wall Street Journal. Retrieved June 23, 2010. ↑ Phillips, Kevin (May 2008). "Numbers Racket – Why the Economy is Worse than We Know". Harper's Magazine: 43–47. http://mathforum.org/~josh/articles/KevinPhillips-NumbersRacket.pdf. Retrieved 2011-08-29. ↑ "Federal Reserve Board—A-Z Listing of Board Publications". Federalreserve.gov. 2011-08-10. http://www.federalreserve.gov/boarddocs/rptcongress/default.htm. Retrieved 2011-08-29. ↑ "96th Annual Report 2008 Federal Reserve" (PDF). Board of Governors of the Federal Reserve System. June 2009. http://www.federalreserve.gov/boarddocs/rptcongress/annual08/pdf/AR08.pdf. Retrieved 2011-08-29. ↑ "Factors Affecting Reserve Balances of Depository Institutions and Condition Statement of Federal Reserve Banks". Federal Reserve. http://www.federalreserve.gov/releases/h41/Current/. Retrieved 2008-03-20. ↑ "The Federal Reserve Does Not Own Any Gold at All". Gold News. 2011-06-02. http://goldnews.com/2011/06/02/fed-lawyer-alvarez-the-federal-reserve-does-not-own-any-gold-at-all/. Retrieved 2011-08-29. Meyer, Lawrence H (2004). A Term at the Fed: An Insider's View. HarperBusiness. ISBN 0-06-054270-5; focuses on the period from 1996 to 2002, emphasizing Alan Greenspan's chairmanship during the Asian financial crisis, the stock market boom and the financial aftermath of the September 11, 2001 attacks. Paul J. Kubik, "Federal Reserve Policy during the Great Depression: The Impact of Interwar Attitudes regarding Consumption and Consumer Credit". Journal of Economic Issues. Volume: 30. Issue: 3. Publication Year: 1996. pp 829+. Link, Arthur. Wilson: The New Freedom (1956) pp 199–240. Marrs, Jim (2000). "Secrets of Money and the Federal Reserve System". Rule by Secrecy (HarperCollins): 64–78. "What is the Fed?" — at the Federal Reserve Bank of San Francisco. Decision of the Reserve Bank Organization Committee Determining the Federal Reserve Districts and the Location of Federal Reserve Banks under the Federal Reserve Act Approved December 23, 1913, April 2, 1914; With Statement of the Committee in Relation Thereto, April 10, 1914. 27 pages. Government Printing Office, Washington, D.C., 1914. Federal Reserve District Divisions and Location of Federal Reserve Banks and Head Offices, Hearings before the Reserve Bank Organization Committee United States. Reserve Bank Organization Committee, 1914. Macroeconomic Effects of Interest Rate Cuts, by Jason Cawley, Wolfram Demonstrations Project, 2007. This page was last edited on 29 September 2017, at 06:13.